Cruise through the Namib Desert’s iconic golden sand dunes on this 3-hour quad bike excursion. Start the day in Walvis Bay where an expert guide shares a brief safety training, then head out on an adrenaline pumping tour of the valleys, dunes, canyons and plains that make this desert famous. Scope out ancient fossils, keep your eye out for the Topnaar people who live in the desert, and learn to identify indigenous flora and fauna. Space in this small-group tour is limited to 15, which means travelers are ensured personalized attention. Kick things off with a safety and test driving session with your guide in Walvis Bay. Then head out on this Swakopmund quad bike tour through the Namib Desert on your 4WD off road vehicle. Cruise through desert canyons and barren plains, then test the limits of speed over pristine sand dunes that lay just beyond the Swakopmund city limits. Take in 360-degree views of this nation’s stark beauty on this off-road tour. Follow your guide, who will point out ancient fossils and well-preserved animal footprints while you learn about the local vegetation and plants that are able to thrive despite unforgiving desert conditions. Catch a glimpse of scorpions, snakes and lizards that scurry throughout the landscape and learn about the Topnaar tribe—a seminomadic people that once made their home at the mouth of the Kuiseb River Valley. 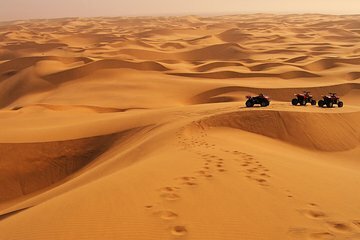 Between these brief stops and informative talks, test the limits of your ATV and open throttle to race across the open valleys of the vast desert. Your guide will provide expert tips to insure you get the most fun and performance from your quad bike on this quad bike tour of the Namib Desert. Return to the starting point with your guide to wrap up this incredible outdoor experience.